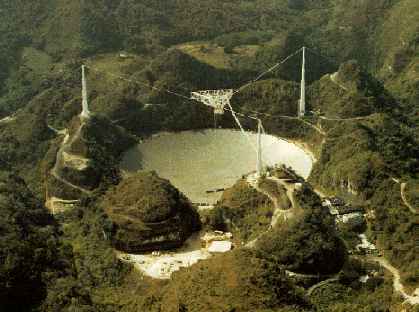 The Arecibo radio telescope is known for its world-famous facility, was opened in 1963, and resides in a natural valley of Puerto Rico. The huge "dish" is 305 m (1000 feet) in diameter, 167 feet deep, and covers an area of about twenty acres. The surface is made of almost 40,000 perforated aluminum panels, each measuring about 3 feet by 6 feet, supported by a network of steel cables strung across the underlying karst sinkhole. It is a spherical reflector . 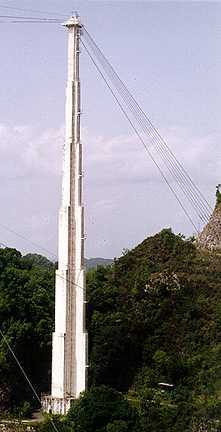 The Arecibo telescope has been used for many astronomical research projects, including searches and studies of pulsars, and mapping atomic and molecular gas in the Galaxy and the universe .